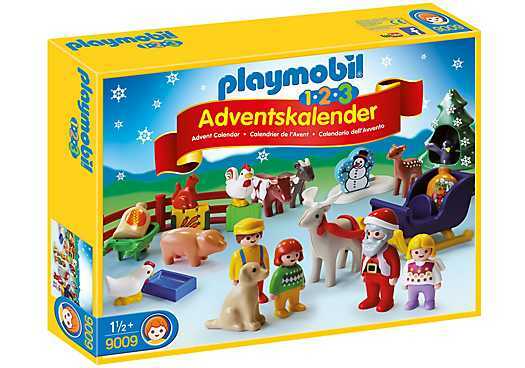 advent calender designed especially for little ones: Comes along with many friendly farm animals and santa with his bag of presents in the reindeer sleigh. Price is 27% below the initial Playmobil retail price, a € 8.18 discount! The 1.2.3 Advent Calendar Christmas on the Farm (9009) Playmobil set is no longer directly available from the sites below. However, 3rd party partners of these sites might still have the set available. Playmobil Christmas Adventskalender "Kerst op de boerderij"
PLAYMOBIL® Christmas - 9009 - 1.2.3 Adventskalender "Weihnacht auf dem Bauernhof"
Playm. 1.2.3 Adventsk. "Wei. A. D. Bau." Santa can be placed in front of the sleigh and fixed by hand clasp. Also a child figure (including the angel) can be placed here. Present bag can be stowed behind the seat. Reindeer gets linked to sleigh with a detachable collar. Wheelbarrow can be pushed by an adult figure (because of height this is not possible with a child figure).